INDIANAPOLIS – Intensive care unit survivors, growing in number as clinicians and medical technology save more lives, are psychologically as well as medically fragile. The first study to examine antidepressant use and depressive symptoms after an ICU stay, has found that even if prescribed antidepressants, a significant percentage–about a third–had symptoms of depression at the time of their initial visit to a clinic specially designed for ICU survivors. Young ICU survivors and African American ICU survivors were at the highest risk for depression. The new study of depression risk profiles of ICU survivors, conducted by Indiana University Center for Aging Research and IU Center for Health Innovation and Implementation Science clinician-researchers, is published in the Journal of Hospital Medicine. In the study, 204 racially diverse ICU survivors, 18 years or older, were screened for depressive symptoms with a standard depression test on an initial visit to the Eskenazi Health Critical Care Recovery Center (CCRC) prior to any treatment in the CCRC. Young age was found to be a risk factor for post-ICU depression whether the ICU survivor was being treated for depression or not. African Americans who had been prescribed antidepressants were also found to be at increased risk of depression. Approximately 5 million adults are admitted to medical or surgical ICUs across the United States annually. The majority survives its ICU stay. Drs. Wang and Khan call for future studies to examine new approaches to increase access to effective depression treatment and to test new antidepressant regimens for post-ICU depression. Authors of “Antidepressant Use and Depressive Symptoms in Intensive Care Unit (ICU) Survivors” in addition to Drs. 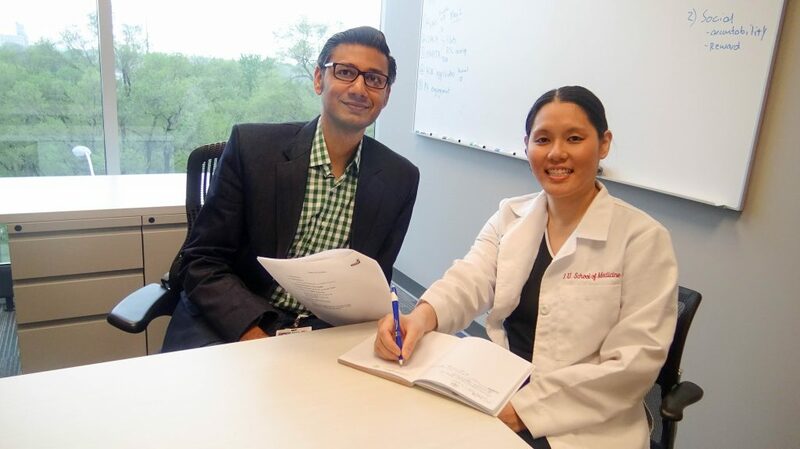 Wang and Khan are Chris Mosher, MD and Sujuan Gao, PhD, of IU School of Medicine; Kayla Kirk, MA of Eskenazi Health; Sue Lasiter, RN, PhD, formerly with the IU School of Nursing and now with the University of Missouri-Kansas City School of Nursing and Health Studies; Sikandar Khan, MD and You Na Kheir, MD of IU School of Medicine and Malaz Boustai, MD, MPH. Dr. Boustani is the founder of the Indiana Clinical and Translational Science Institute’s IU Center for Health Innovation and Implementation Science; associate director of the IU Center for Aging Research, a Regenstrief Institute investigator and Richard M. Fairbanks Professor of Aging Research at IU School of Medicine. The authors note that their study provides a much-needed database for future research and potential personalized mental health treatment of ICU survivors based on objective measurement of their depressive symptoms and a greater understanding of risk for these symptoms. The study was supported by the IU Center for Aging Research and Eskenazi Health. The internationally recognized Indiana University Center for Aging Research was established in 1997 through collaboration of the Regenstrief Institute, IU and IU School of Medicine. The IU Center for Health Innovation and Implementation Science is a program of the Indiana Clinical and Translational Sciences Institute. The center’s mission is to use implementation science to produce high-quality, patient-centered and cost-efficient health care delivery solutions for health care systems of any size, anywhere.